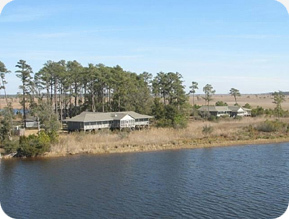 Jones Island Club is located 35 miles east of New Bern, North Carolina near the community of Hobucken. Jones Island, approximately 5000 acres, extends southeast from the Intracoastal Waterway into the Pamlico Sound. It is bordered on the north by Jones Bay and on the south by Bay River. The mainland property is directly across the waterway from Jones Island.